So even though I usually keep the photo posts over on my photo blog, I wanted to share a little bit over here because that’s how much I love staring at pretty, sparkly, lit up Christmas trees. I think the pagans were right on the mark with this whole tree idea. Below are one picture I slated for Zoe Says and another from Flickr that I’m linking here because I couldn’t decide which look I loved most. Ah, the magic of editing software. However, if you want to see more, because obviously I took lots of different shots from different angles and processed them differently, go here or here. That’s the best description I think anyone could have for Christmas decorations! As long as it means something to you, that’s all that matters. Love! I like outdoor trees with lights. Nothing wild or flashy. Just a tree on snowy ground, dark sky, and lights. I agree with you, Charles, there is something almost magical about that. 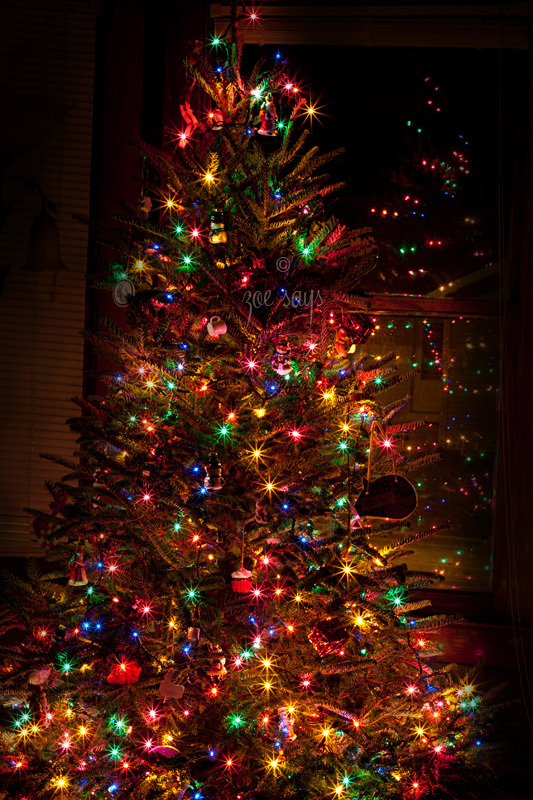 Do you put up lights outside your home (on trees or otherwise)? It does look beautiful, Zoe! I have been trying to capture the beauty of our tree at night, but I don’t think I understand my canon rebel settings well enough yet. They just aren’t turning out! haha! I’ll keep playing. I think I’ve figured out that a flash ruins the photo. Ah, such science to get to beauty. Anyway- great pics! Oh!! That’s what I have, a Canon Rebel XS. Are you using a tripod? If you go to the link I put with the tutorial, it explains everything you’ll need to take photos of your tree. I was shooting on RAW in Manual on a tripod with a 50mm lens. I then processed the photos in Lightroom.